Happy Halloween, Alex! We love you! Tuesday, October 30 - We're at the Charleston City Marina, home of the Megadock. They provide a service we haven't seen before: a free USA Today newspaper delivered to the boat each morning - first newspapers I've read since leaving home three months ago. Mom and Mary arrived around dinnertime on Saturday and the four of us decided to go out. 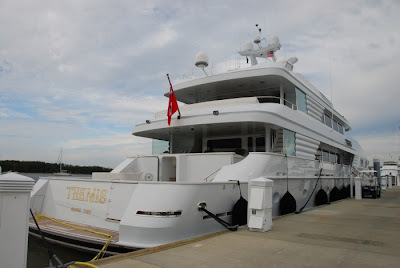 On our way out we stopped to gawk at Themis, a yacht that was docked nearby. The rest of the weekend was fun, if anticlimactic. On Sunday, Mom, Mary, Wayne, and I took a mini bus tour of Charleston - a beautifully preserved and restored historic city. Gary joined us Sunday afternoon. This was the first time we've had more than one extra person spend the night on the boat. We can accommodate seven people comfortably, as long as no one brings any stuff and doesn't walk around (Lena Bea ain't no Themis). It might have been a little too claustrophobic for Mom and Mary, because they decided to leave Monday morning instead of Tuesday. They said it was because they wanted to stop and see Savannah on the way home. I spent the afternoon strolling around downtown Charleston, while Wayne and Gary perused the Maritime Museum. They stopped and picked up some fresh salmon, which Gary prepared for dinner. It was magnifique! We're spending the night in Beaufort, South Carolina at Port Royal Landing Marina. We plan to leave the ICW tomorrow at 3:30-4:00 a.m. for the open waters of the Atlantic and sail to St. Simons Island in Georgia. 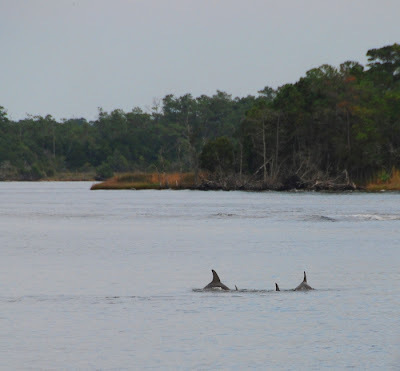 Because there's been no funding in recent years for maintenance dredging of the ICW from south of Port Royal Sound, SC to Cumberland Sound, GA, there are a lot of trouble spots. Add to that a tidal range of 8-9 feet and the advice of locals to avoid the ICW in that area...well, it didn't take much to convince us. 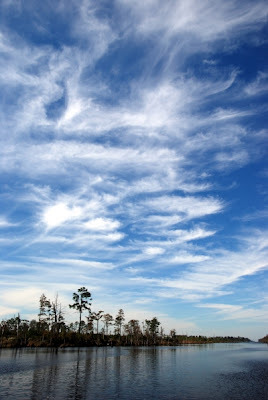 Of course, we checked the weather carefully before making our decision and have noted places where we can easily return to the ICW if conditions outside are unfavorable. Of course, we are keeping a close eye on the tropical storm, Noel. I'm disappointed that this means missing a stopover in Savannah, but we have to weigh all our options and make the best decision based on all factors. If you go back and look at the posts from the past few days, you'll see that I was finally able to add some photos. They give you an idea of the variety of scenery on the ICW and were all taken this week, but not necessarily on the day of the post you see them on. I get to see my Mom! Today we'll be docking in Charleston, where we have a busy weekend planned. Mom and her friend, Mary, are coming to Charleston today and will be staying with us until Tuesday; we plan to do some sightseeing. Gary will join us on Sunday and stay to accompany us on the next leg of our journey. Today is notable for another reason: three months ago, on July 27, we left the dock in Bayfield, Wisconsin. Wow. Sometimes I can hardly believe we've actually done this and made it so far. Yesterday I packed up our down, fleece, and woolens to send back with Mom. We're on the home stretch and it feels good. "I think you scraped some paint off your mast on that one, Captain," were the words radioed to us by the captain of the boat behind us, referring to the first of a set of three fixed bridges we slipped under. Although we're watching, it is impossible to tell whether we’re going to make it or not until we have actually made it...or not. Yet Wayne expects me to watch and give him a confident thumbs up or down. This was one of the worst so far - it did not look like we could clear it, but we did. Whew! A little paint is a small sacrifice to make. Radar showed that we were surrounded by thunderstorms today, but we only experienced periodic light showers (excluding the heavy downpour that delayed our departure by half an hour). We were grateful to have missed the storm that left the Waterway littered with leaves and branches. Inadequate depth was almost not an issue today. Our shallow-water alarm, which we have set to go off at eight feet, didn't go off until the last hour of the day, and even then the water didn’t get terribly shallow. We did get stuck as we were anchoring in Five Fathom Creek, but the rising tide freed us within minutes. Yes, we certainly felt God's protection today. many birds, and today we even saw a bunch of goats. There's evidence that we are farther south, including palm trees (in North Carolina? That's pushing it), the first pelicans of the trip, and yes, even no-see-ums. It’s slow-going on the ICW, though, and requires vigilance. With shallow water due to shoaling in many places, we often have to slow down; we scraped bottom a couple times and came close several more times today. Because of that, it is easier and more relaxing to travel during high tide, but it's less stressful going under bridges at low tide. I must say, though, that the bridges have almost become a non-issue; we have gone under so many that we've gotten used to them, and of course it helps that we have not hit one yet. The weather continues to be hot and muggy and cools off very little at night, but we don’t complain, considering what the weather could be. Today we were supposed to be in thunderstorms all day and they totally missed us; more are predicted for tomorrow. Because the ICW is so narrow and shallow (so far, anyway), there are very few places to anchor, but tonight we had planned to anchor in Calabash Creek in Little River, South Carolina, which we were told is a very nice anchorage. Well, we tried to get into the creek but ran aground at the entrance (how did all those other boats get in there?). Wayne managed to get us free and was not about to try again, so we ended up at Harbour Village Marina in Hampstead. It annoys me to have to dock when we would rather anchor and then have to pay for it besides. Many of these marinas have wonderful facilities, which we pay for whether we use them or not, which we don't. All we need is a place to tie up the boat so we can sleep. It's like being on a road trip and staying at a Marriott when all you want or need is a bed and a bath. Or traveling in an RV when all you need is a truck stop or WalMart parking lot, but being forced to pay for a campground with all the amenities. Tonight is pretty cheap, though - only $1.00/foot ($45). Our son, Joey, called us on Monday with tragic news: Jeremy, a friend of Joey and his roommate, lost his mom, Tammy, and his brother, Jayson (his only parent and only sibling) in a car crash. Jayson's friend, Nicholle, was also killed. Please remember Jeremy in your prayers, and also ask God to show Joey and Kyle how they can best support their friend during this unspeakably tragic time. Wayne again. Of course, each time I go to write something Michele has beat me to it, but I thought I would add a few thoughts anyway. 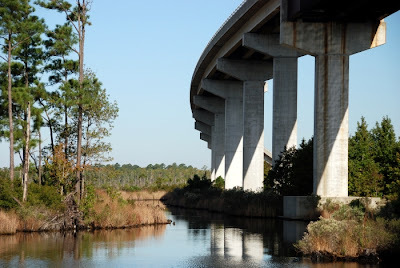 So far we have traveled about 200 miles in the ICW (IntracoastalWaterway) since leaving Norfolk. I had hoped to avoid some of the ICW by going outside in the Atlantic. By going outside, I can avoid bridges and shoals. 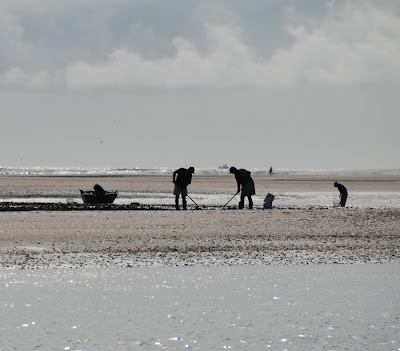 Shoals are submerged sand bars that shift with the currents, and reduced funds for dredging has made the problem much worse in the last several years. The soft grounding Michele referred to on Monday was caused by shoaling. 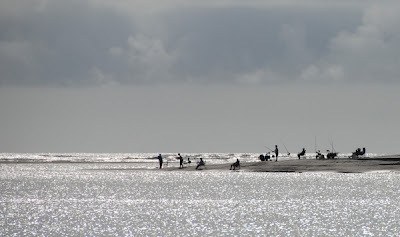 I had turned away from the sand bar and slowed down as the depth quickly dropped, but still caught the edge, which is why we were lucky enough to get off with a little help from a rising tidal current. As far as going outside (in the Atlantic), sometimes that option gives us a shorter distance and we are able to go faster. Of course, going outside has it's own set of problems, the primary one being weather, so I have to constantly look at the pros and cons. I was hoping to go outside tomorrow to save time, but the weather is not cooperating, so we will take the ICW. About those bridges! They have been a concern since before we left the marina in Bayfield. It is very scary to go under a bridge that is only one or two feet taller than your mast. It looks like you are going to hit the bridge until you are under it. There are also navigation lights that usually hang down from the bridge that I have to avoid hitting. I need to watch tide levels and currents. It is much easier now that we have gone under several of these, but I will still approach with caution! We were twenty minutes from Beaufort, North Carolina and I was taking a quick shower when all of a sudden, thud! The boat stopped abruptly and the first thought that came to mind was, "Why did he slam on the brakes?" The second thought was, "Oh. The boat doesn't have any brakes. So what made it stop so abruptly?" I grabbed a towel and ran to see what was going on, only to find a very irate Captain...who had just run aground. Again. I shrugged my shoulders and said, "Just call Tow BoatUS." Wayne did not appreciate the suggestion, so I made myself scarce while he figured out what to do. Before long I felt us moving again - he had wiggled and finessed the boat free with the help of the engine and the rising tide. 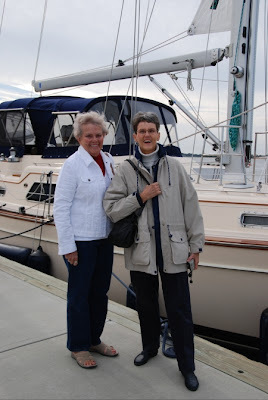 However, because of the shallow water, we were forced to take a detour of an hour and a half to get to the Beaufort Docks Marina, where we docked for two nights. 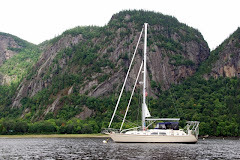 Yesterday and today we have been in the company of many more sailboats than we were over the weekend - fellow cruisers heading for Florida, the Bahamas, the Caribbean, and other points south. Much of the channel through this part of the Intracoastal Waterway is so narrow - not unlike a two-lane road - that boats will radio each other if they want to pass, so the increase in traffic definitely has an impact. Last week we got word from our insurance company - which has had the policy of making absolutely no exceptions in this regard - that they have given us the go-ahead to travel south of 35 degrees latitude before November 1. Yesterday we were en route to Oriental, NC to get the official approval, but Wayne was able to talk to them by cell phone and get the written confirmation via satellite phone and email while underway. Don’t you love it when technology works? This impacts our plans in a big way: instead of traveling nonstop from Oriental, North Carolina to Miami, we have time to stop in Charleston, SC and Savannah, GA. I may have already mentioned this (it's hard to remember what I’ve said in the blog and what I have only said in emails), but we have a deadline of making it to Punta Gorda, Florida before Thanksgiving because two of our kids (Michael and Suzanne) and their families are coming to visit. I want to get there the weekend before Thanksgiving at the latest to allow us time to regroup, catch our breath, and get the house opened up and ready for company. Being able to head south earlier should allow us more than enough time. 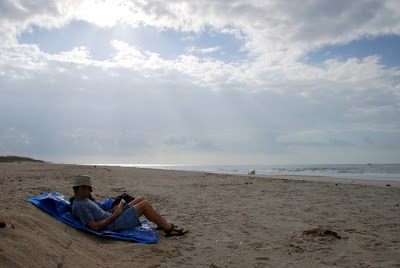 A big disappointment in North Carolina is that we are not able to go to the Outer Banks because of shallow water. With that in mind, we decided to skip a planned stop in Oriental, NC ("The Sailing Capital of North Carolina"), and go all the way to Beaufort tonight. 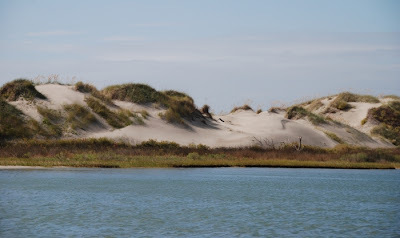 From there we can take a water taxi to Shackleford Banks, Cape Lookout, etc., which will give us a small taste of the Outer Banks. 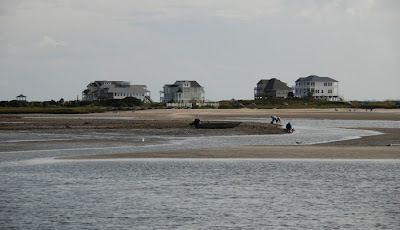 When we leave Beaufort on Wednesday, we will leave the Intracoastal Waterway (weather permitting) and sail the Atlantic to the Cape Fear Inlet, which returns us to the ICW. Gary DeSantis of Sailor's World Marina on Lake Minnetonka in MN - a good friend and the dealer from whom we bought the boat - plans to join us in Charleston and will probably sail all the way to Miami with us. Disclaimer: all plans are subject to change based on weather, winds, and what-not, including the whims of captain and crew. 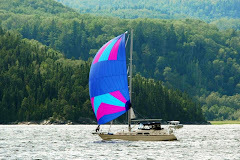 By the way, Gary and we have a beautiful and well-maintained, freshwater Island Packet 37 named Wind Dancer for sale. We can personally vouch for the integrity of both vessel and dealer (and present owner of Wind Dancer, obviously). Faith: \ˈfāth\ (1): firm belief in something for which there is no proof (2): complete trust (3): to pass under a bridge said to have vertical clearance of 64' in a boat approximated to be 63' high. 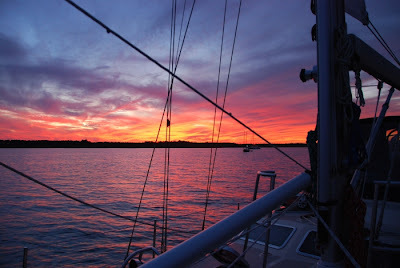 Saturday, October 20 - We anchored at the mouth of the Alligator River in North Carolina after a day of spectacular sailing through the Albemarle Sound. We made it safely under two more 65' bridges without incident, but not without anxiety. 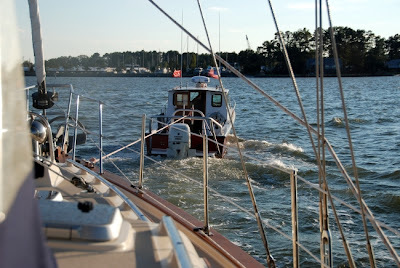 We anchored at Belhaven, NC and dinghied into shore. A quick look around town revealed that nothing appeared to be open nearby except the local Ace Hardware store. Very interesting place. They sell everything from the usual hardware fare to clothing, used books, appliances, and wine. There was even a cooler filled with beer, champagne, caviar, fresh crab meat, and gourmet cheeses...on the same shelf as the boxes of NIGHT CRAWLERS! Friday, October 19 - As soon as I knew there was an actual shopping mall within walking distance of the marina, I knew how I would spend our first day in Norfolk. 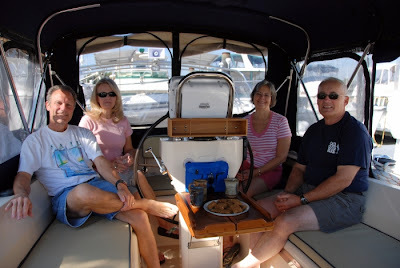 I needed some alone time and Wayne had boat projects to do, which invariably involves having all the cushions off the settees so he can get to his tools, and having tools, cushions, and junk scattered all over the boat. The chaos makes me a wee bit crazy since there's usually no place left to sit, I'm in his way, and it is hazardous stepping around tools and what not. He was probably glad to have a little space himself, so it was a win-win deal. [Men will probably want to skip this paragraph.] I was at the mall ten minutes before it opened, pacing in front of the Dillard's entrance, looking at my watch every thirty seconds. I think the last time I was at an actual shopping mall was in Sault Sainte Marie, and that was rushed. I did not intend to buy anything, but having time to just browse as long as I wanted was a luxury; I spent five hours there! Speaking of luxury, the first thing I did was treat myself to a badly needed (and well deserved) pedicure. Aaaaaah! As I told Wayne afterwards, I finally felt feminine again; I have not worn any makeup since well before the start of our trip and the pedicure gave me a boost. The marina couldn't let us stay another night because of the wine festival this weekend, and even the anchorages nearby appeared to be fully occupied. We had wanted to see Nauticus (The National Maritime Center), which is now the permanent home of the largest U.S. battleship ever constructed, the USS Wisconsin. There was no time to tour Nauticus, but we did run over to tour the USS Wisconsin before checkout time at noon. 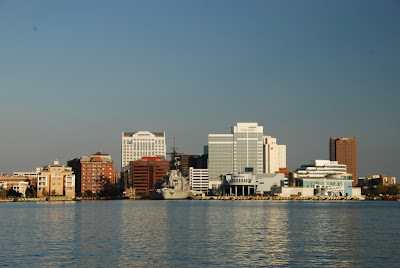 Although mile "0" on the Intracoastal Waterway is in Norfolk, the ICW actually starts in Boston (some resources say Maine, and yes, it does include the Chesapeake Bay). 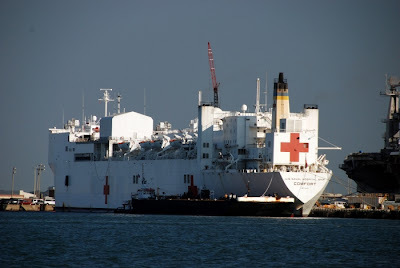 From Boston it goes south to Florida and then along the Gulf Coast to the Mexican border, via interconnected canals, creeks, rivers, bays, and sounds. At Wayne's insistence I stood on the bow trying to calculate whether or not we would make it under the first fixed bridge, and make it we did (hallelujah! ), with probably a couple feet of headroom to spare. As I returned to the cockpit, Wayne asked if I would steer while he went down to change his pants. The second fixed bridge was a different story: we cleared it, but barely. From my vantage point on the bow, there did not appear to be any space between the anemometer and the bridge; we think the antenna actually hit it. Yikes! I just looked at the chart and counted thirteen 65' bridges (one is 64') ahead of us in North Carolina alone! I told Wayne and he said we will probably go out in the Atlantic to avoid some of them. Parked ourselves at the Pungo Ferry Marina for the night. We are about to leave Norfolk and Wayne seems on the verge of a nervous breakdown. 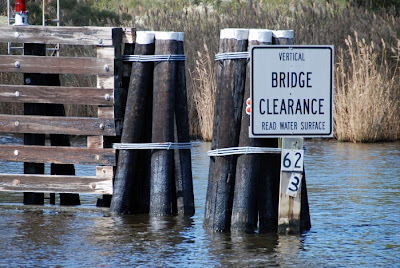 We will, God willing, pass under the first of some 65 foot bridges today, and Wayne is calling everyone from the Army Corps of Engineers to the Coast Guard to President Bush (ok, probably not him) to find out if it is truly 65 feet, or, as we have read, possibly a foot or two lower. Our mast is supposedly 62 feet - we have not actually measured it - but if you add on the VHF antenna and the anemometer (wind instruments), it's probably 63', give or take a few inches. Sure wish I had some tranquilizers for the Captain. Stay tuned...Meanwhile, your prayers will be greatly appreciated. As we left the York River yesterday, Al and Betsy on Morning Star (another Island Packet) saw the boat and hailed us on the VHF radio. They’re from Virginia and have been following our blog, which they learned about from the Island Packet email list! Hi, Al and Betsy! Wish we could have met you in person. We’re happy to hear that you're enjoying our blog. Now we’re docked in Norfolk for two nights. We may stay longer, but there’s a big wine festival on the waterfront this weekend and the marina will be full with prior reservations. We’ll try to anchor nearby if we decide to stay longer. Regardless of how you feel about the war, it was a jaw-dropping experience to boat through Norfolk and see all the "war ships" as they call themselves. There were dozens of them. 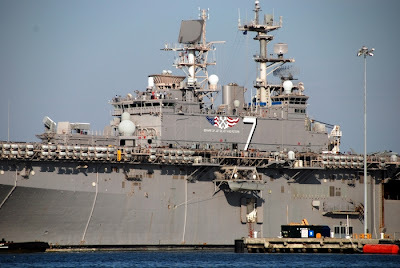 It was interesting to listen to them on the VHF radio; we heard one ship - "amphibious assault ship number 7" - announce that he was under way just moments before we saw him leave the dock. I am not interested in war ships (or ships of any kind, really), but even I was impressed. Just one look at these intimidating monsters should be enough to make the enemy surrender. 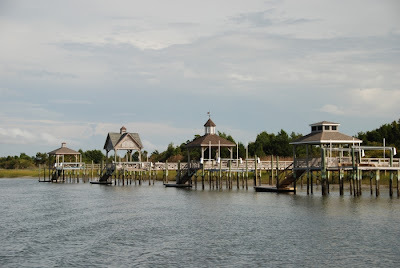 Wed., Oct. 17 - Today we leave Gloucester Point, Virginia, where we've been since Saturday evening. It was such a pleasure to re-connect with my cousins. Diane and Terry moved their family to the east coast about 20 years ago and Karen moved out here with her son, Charlie, about 10 years ago (I hope I have those years right). We’ve seen them on occasion when they've returned to Minnesota to visit, but only at funerals and other large family gatherings. Prior to their moving, we didn’t see them much more than once a year at the annual Christmas party, so it was special to have time with just them. Karen, Diane, and Terry joined us at the marina Sunday morning at about 9:30. We spent some time visiting on the boat, then they took us out for brunch in Historic Yorktown. We went for a nice drive on Colonial Parkway, through Historic Williamsburg, and to Karen's new townhouse in Williamsburg, where we met 20-year old Charlie. From there, we all went over to Diane and Terry's new house, just five minutes away. Both families moved up to Williamsburg from Yorktown in May/June to be closer to Terry's office and their kids. We spent a very pleasant day with them, as well as Diane and Terry's son, Alex, who is 21, their daughter, Steph, son-in-law, Dave, and Steph and Dave’s lively, adorable 14-month old twins, Hannah and Jack. Diane and Terry insisted that we take their car for two days. It was such a generous offer and how could we possibly turn it down? I doubt that a newly-licensed 16-year old on her first night out with the family car could have been more eager. "In Colonial Williamsburg's 301-acre Historic Area stand hundreds of restored, reconstructed, and historically furnished buildings. Costumed interpreters tell the stories of the men and women of the 18th-century city—black, white, and native American, slave, indentured, and free—and the challenges they faced. In this historic place, we help the future learn from the past." Later...Diane called me this morning at 9:00 to see if we had time for visitors before heading to Norfolk. Hers and Karen's other sister, Marilyn, and Marilyn’s husband Paul were visiting from Minnesota and wanted to drive down and see us and the boat. We weren’t about to pass up that opportunity, so we moved our departure time back a bit and welcomed them aboard for a short but sweet visit. After we docked, licked our wounds, and checked in yesterday, we decided to have dinner out. We asked the woman in the office where to go and she suggested "Cocomo's." The restaurant offers shuttle service between there and the marina, so she gave them a call and arranged for us to be picked up at 6:45. We were waiting in the drive when our shuttle pulled in, driven by an elderly couple with a Yorkie. Come to find out, Virgil and Myrtle are the parents of the restaurant owner and it's their 61st wedding anniversary. The dog is not theirs - they were dog sitting for restaurant patrons who did not want to leave him in the car while they dined. Now, that - dog sitting and running a shuttle service for their son's customers on their wedding anniversary - is parenting above and beyond the call of duty. The service went downhill from there and the food was so-so. All was not lost, however, because we met another sailing couple, Sarah and Roger (a self-proclaimed match.com success story), and had a nice visit with them before and after dinner. They ended up following us back to the marina for a look-see at the boat. In an attempt to avoid a recurrence of yesterday's mishap, we decided to leave at high tide today - about 11:30. I knew immediately what to do with our free morning, as I had noticed a flyer advertising the Holly Point Art and Seafood Festival. We borrowed the marina's courtesy car and had a lovely hour browsing the art booths, watching the Renaissance-costumed performers, and just enjoying the folksy atmosphere. We had to partake of the seafood portion, of course; I had the best shrimp salad ever, while Wayne opted for the barbecue. 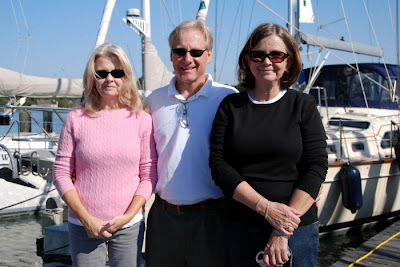 Now we're docked at York River Yacht Haven in Gloucester Point, Virginia, where we will be until Tuesday or Wednesday. 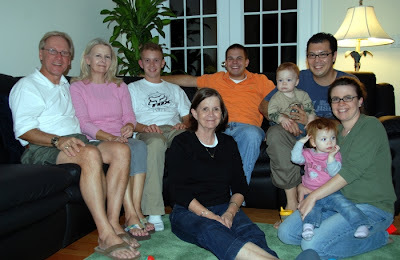 Tomorrow my cousins, Karen and Diane (Schwabe), and Diane's husband, Terry (who live in Williamsburg), will pick us up and we'll spend the day with them. We’re really looking forward to that! First Grounding - Deltaville, Virginia, just outside of Dozier's Regatta Point Yachting Center. I’d better let the Captain tell you about this. Wayne: Well, as the saying goes, it is not if, but rather when, you will go aground. After all of the difficult areas we have been in, I certainly did not expect to go aground in the middle of a well-marked channel, going to a marina with a lot of other sailboats (usually a good sign of adequate depth). As usual, I had even checked with the marina before entering, but they didn’t warn us and we got stuck in four feet of water in a boat with a five foot draft. Fortunately, the bottom is mud, so there was no damage to the boat. Our boat has a modified full keel with great protection for the rudder and propeller. We also have unlimited towing service with BoatUS. Several years of membership fees quickly paid for themselves as BoatUS arrived in less than thirty minutes and pulled us out. After getting us free, he towed us through another shallow area and pulled us out again through that. He said this channel was a major problem. I am disappointed that the marina was not better informed (it is a very large major marina in the area), and I spoke with them about the problem when we finally got in. Now I have to figure out how we are going to leave without getting stuck again. We will leave at high tide to get an extra eight inches of depth (we were at about mid-tide coming in), and talk to more locals, who usually know the best route through the channel. Thursday, Oct. 11 - A rain shower and wind heralded in a cold front during the night, bringing relief from a week of stifling hot, humid weather. We turned off the fan and dug out the down comforter once again. Wayne had the sails up before we left the harbor, not wanting to waste a minute of the strong winds beckoning to carry us to Tangier Island, Virginia. With winds at 18-24 knots and gusting higher, we averaged 8 knots. Of course, the downside of such winds is docking this monster (have I mentioned the boat weighs about 20 tons with full tanks of fuel and water?). There were three guys on the dock at the Parks Marina to help us, though, thank goodness! "Life on Chesapeake Bay's Tangier Island hasn't changed much over the centuries. There's no bridge to the mainland. Locals speak with a distinct dialect, which can be traced back to the island's earliest settlers from 17th-century Cornwall in England. Life revolves around fishing, church and chatting with neighbors over white picket fences...."
"It's the local culture that makes this place so fascinating. Most people here can trace their ancestry back to the 17th century, when John Crockett is said to have settled the island with his children. Today, most are at least distantly related and have one of a few last names -- Crockett, Pruitt and Parks are the most common. Many families live in homes passed down for generations, complete with ancestors buried in the back yards." Yes, you read that right: Many homes have their own graveyards, and some look like the set of a horror movie. This would be one creepy town on Halloween. "Now, this quaint way of life is under threat. Crabbing isn't paying the bills anymore, and many watermen are leaving to find jobs elsewhere. Some parents worry that, for the first time, their kids won't have any reason to stay when they grow up." Ok, so the kids decide to leave and put the house on the market. This inquiring mind has questions: What happens with the ancestors? 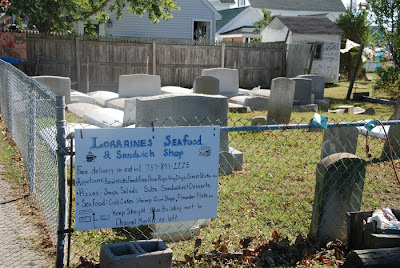 How do you market a home with its own graveyard? Who would buy a house with someone else's dead relatives buried in the front yard (and you thought that mauve carpet was a deal-breaker)? Also, how would said ancestors feel if they knew they had been abandoned to continue decomposing in some stranger's front yard? That would be grounds for some serious haunting, if you ask me. 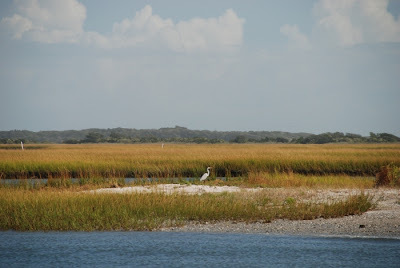 Wednesday, Oct. 10 - This afternoon as we approached Solomon's Island, a highly recommended destination in the Chesapeake Bay, Wayne asked me what I wanted to do there after we anchored. Honestly? Nothing. I just wanted to stay on the boat. So we dinghy to shore, walk around town, and return to the boat hungry and too tired to make dinner. No thanks - that routine is getting old. We have been to so many great places and I am sure this is a great place to visit as well, but...I'm tired. I am even tired of taking photos, as you may have noticed by the lack of new ones on the blog recently. If I could snap my fingers and be in Punta Gorda tomorrow, I would not hesitate. Don't get me wrong - I’m certainly not desperate to be done with the trip - I still enjoy it, but the novelty has worn off, the finish line is in sight, and I will be ready when the time comes. So what did we do for fun? 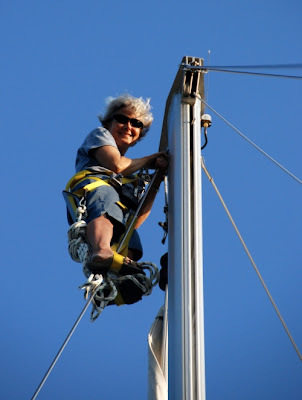 I got to go up to the top of the mast! 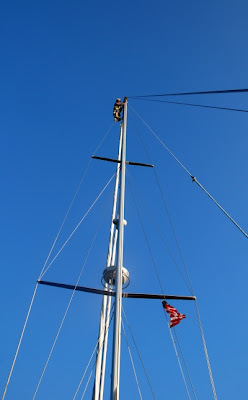 Wayne thought our anchor light was burned out, and going up is probably his least favorite thing to do. I, on the other hand, have been waiting for the opportunity, so I grabbed the new bulb and our little camera and Wayne helped me into the bosun's chair (harness). He then hoisted me up, very carefully, using the electric winch. It wasn't much fun being at the top of the mast when a power boat zoomed by, leaving a wake that rocked the boat. I got to the top and realized I wasn’t tall enough to reach up and change the bulb, but before Wayne lowered me down I spent a few minutes enjoying the view from 62' up and took some photos. I then hoisted Wayne up and he changed the bulb, which was not even burned out after all. Wayne: Interestingly, I am prone to motion sickness, but have never been seasick. I have learned how to avoid and/or reduce the effect of motion. After a few days on the boat, we actually get used to the motion, but I am also aware that I could still get seasick if conditions were bad enough (we hope to avoid those conditions!). Michele can actually go down in the cabin and read in rough seas! Michele: I got seasick once, when we went deep sea fishing with Wayne’s grandfather and his brother, Greg. I never want to experience that again! That said, I also know I could get seasick again under the right (or wrong) conditions. But just as I learned many years ago - the hard way - not to look out the side windows while riding in a car on a curvy mountain road, there are things we do to avoid seasickness. For instance, look at the horizon, do not watch the waves, and spend minimal time in the cabin when it’s rough. I can be in the cabin if I lie down and close my eyes, though. And Wayne is right - I can go down in the cabin and read if it isn’t too rough. If I must be down below for any length of time under rough conditions, I’ll sometimes pop a piece of ginger gum as a preventive measure; I have also used Motion-Eaze, an herbal formula that you dab behind your ears, which works really well. We have other remedies and preventatives, including Sea Bands (acupressure bands for the wrists), but have not felt the need to use any of them yet. We don't use Dramamine or the like. 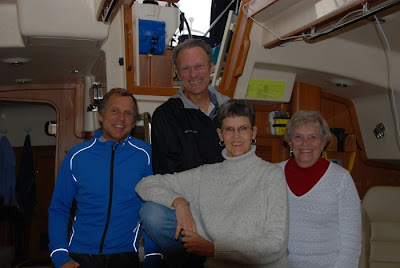 Our friends, Claus and Rachael, say seasickness is mostly psychological. It never occurred to me for a second that this would happen, but there’s something on the blog that at least three people have misunderstood and has me all but rolling on the floor laughing. The section on the right, "Read what the critics are saying about the Lena Bea blog?" Well, "the critics" are...is...me! That’s why they are all signed "anonymous." I guess I have to take it as a compliment, though, because I wouldn’t have fooled anyone if it were too far from the truth...RIGHT? But really - "The most compelling boating adventure since Gilligan's Island?" Have these people ever seen Gilligan's Island? You’ve probably figured out my sense of humor by now and are no longer fooled, if you ever were. Thanks for the belly laughs (you know who you are); I guess the joke was on me. We’re still in Annapolis, having spent two partial days at the Annapolis boat show, the largest sailboat show in the world. 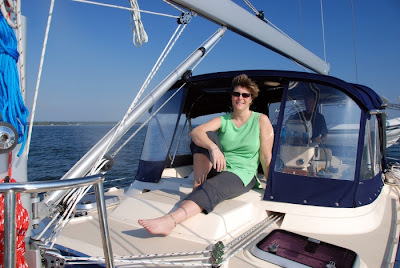 Suzanne enjoyed looking at all the different boats with us on Sunday before leaving at 6:00. We started the day Monday by meeting up with another Island Packet couple for breakfast at Chick and Ruth's. Wayne knows Hayden and Radeen through the IP email list that he has participated on for years, so it was especially fun for him to finally meet them. They had great suggestions on where to go in the Chesapeake, which we intend to follow up on. We perused the boat show for a few hours and found some things for the boat we didn't know we needed (naturally). Around 3:00 we had visitors - Dan and Barbara Interlandi. Dan, who retired in August, was a business associate of Wayne's for over 25 years. An interesting bit of trivia that Dan, Barbara, and Wayne have in common: all three of them are half Sicilian. Right now Wayne is finishing up repairs on a couple of things that have plagued us from day one: He found out the power supply for the VHF radio hailer was bad, so he had to replace the entire VHF radio. He determined that the battery charger had a faulty circuit breaker. It worked intermittently, which made the problem hard to diagnose, but it has worked perfectly since he replaced it. As soon as Wayne is done, we'll head over to St. Michael’s and anchor for the night. 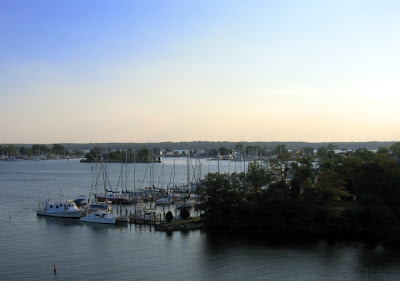 We just docked in Annapolis and are right in the heart of the boat show - Yacht Basin Company, slip 75. If you happen to be at the boat show and are checking this blog, do look us up. Wayne's phone # is 612-867-3017. We will be here through tomorrow. My stomach and throat had been bothering me for a few days, but I didn't think much of it until yesterday morning when I woke up to a very sore and swollen throat. The pain in my stomach became worse as the day wore on, and by the time Suzanne called to say she was about 45 minutes away, I could barely get in the shower. We visited for a while when she arrived, then I started vomiting (no correlation). I could not prepare the dinner I had planned and sent Wayne and Suzanne up to the marina restaurant without me. I laid down for an hour, unable to sleep or move as the pain increased to a "9" on the scale of 1-10. I finally called our clinic at home to see what they thought I should do, and the nurse told me to get to the emergency room. Well, I certainly did not think an ambulance was necessary, so the security guard came and got me on the golf cart and drove me to the restaurant where Wayne and Suzanne were just starting dinner. There’s no way I could have walked. Wayne called a cab, for which we waited about half an hour, then drove for half an hour to Christiana Hospital in Newark, Delaware; by this time I was in agony and second-guessing the ambulance thing. My heart sank as we walked into the jam-packed ER, but mine was the first name called and they got an IV and pain medication in me as quickly as they could. To make a long story short, all the lab work came back normal, and as she did the ultrasound on my abdomen, the doctor declared my gall bladder to be "pristine." They think it was a case of gastritis - an irritation in the stomach lining without an ulcer (I've never experienced it before) - and believe the sore throat was caused by stomach acid backing up. That makes sense, because it was unlike any other sore throat I have had. We returned to the boat at 2:30 a.m., sorry that we had to leave Suzanne alone on the boat our first of two evenings with her, but thankful that I did not need to be admitted for something more serious. Two trips to the ER in less than a month! And to think I’ve only had one other in my adult life, 22 years ago. I should be covered for a long time now, right? I’ve been a busy blogger today, as you may have noticed. I added several posts (including questions and answers from Wayne), amended a couple of previous posts, and uploaded photos. 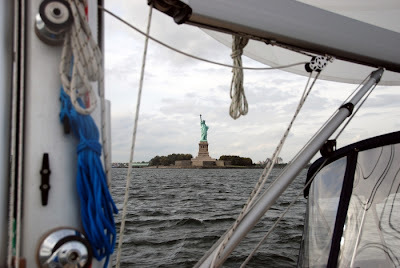 I added a definition of "nautical mile" to the right under our email address, and added a link to a sailing glossary under "links" (which I will be referring to a lot myself). I'll try to get some photos uploaded to the Costco site later today or tomorrow. Questions of the day: "You know, we women have a limited perspective. We write about the way we're feeling, and about people, relationships, and all that girly stuff. Now we need the facts. Like Shelley is talking about "mooring" and “dinghies” and stuff like that in the middle of these ponderings, but she forgets the wonderful education you've helped her acquire that we don't have. How about a glossary and a little sailing tutorial so we know what the heck she's trying to say to us. Interpretation please!" Wayne: A glossary is a great idea and we will try to add one. [Done! See links.] 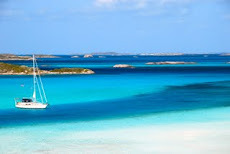 A mooring is a place we secure our boat to instead of anchoring. They have a line/chain permanently secured to the bottom by concrete, granite, or something relatively immovable. It is identified by a large floating sphere and has lines for attaching to cleats on the bow of our boat. A dinghy is a small boat that is used to get to and from shore when we are anchored or moored. We have a 10'2" inflatable dinghy with a hard bottom. It is powered by a 15hp Honda outboard. 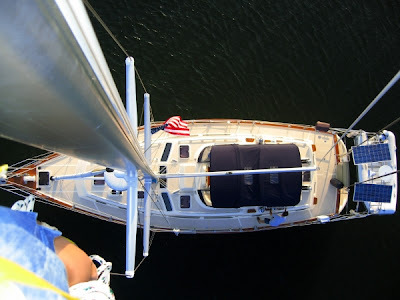 When not in use, we hoist it up on davits [davit |ˈdavit; ˈdā-|noun - a small crane on board a ship...for suspending or lowering a lifeboat] on the back of the sailboat, which you may be able to see in some of the photos. Q: How do you determine when to anchor and when to moor? Wayne: We moor when there is not a good option for anchoring. 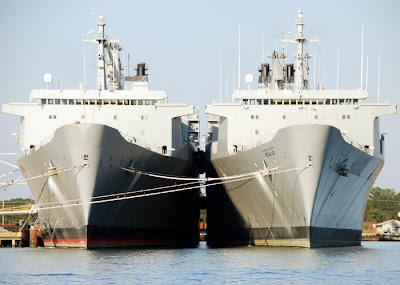 Many times all of the space in a harbor is full of moorings, leaving no place to anchor, or the wrong conditions exist, such as poor holding, too shallow, too deep, or not enough room. Tuesday night in Atlantic City we docked at the Senator Frank S. Farley State Marina, aka Trump Marina - Hotel - Casino. Of course, we had to take a walk on the boardwalk, so we rode the Jitney bus as far as Trump's Taj Mahal. The Boardwalk was...interesting, but not one of those places Wayne had to drag me away from. After we returned to the marina, Wayne went back to the boat and I went in the casino and played the penny slot machines for an hour or so. We left Atlantic City Wednesday morning in heavy fog. 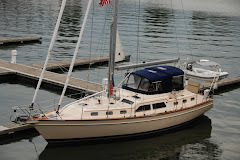 We discussed whether we should stop in Cape May, NJ, which would leave over 70 nm to travel on Thursday, or go all the way to Summit North Marina on the C & D Canal (which connects the Delaware and Chesapeake Bays). Wayne called the marina to find out if there was an intermediate place to stop in the Delaware Bay; they confirmed what we’d been told - that there was not. They assured Wayne that docking after dark would not be a problem though - that the canal and the marina were well lit and easy to navigate, with good depth and no hazards. Wayne also checked tides and currents and determined that they were in our favor for travel that day, so we went the distance. We made the 100 mile trip in about 14 hours and docked uneventfully, although the marina was not as well lit as we were led to believe, and a spotlight was necessary to find our way to the dock. Now we have a day and a half to catch our breath and get some things done before Suzanne joins us Friday afternoon. It's been very warm the past couple days! We had the boat totally opened up for the first time since mid-August, and the past two nights we’ve slept comfortably with just a sheet over us. 65 degree lows in October? Toto, I don't think we're in Minnesota any more! We feel that, from this point on, very cold weather should not be an issue. We are also in the Intracoastal Waterway now, which gives us a sense of security, at least as far as bad weather is concerned. Q: "Yes Wayne - we must hear from you. I was sure you would want to weigh in on several occasions as I've read Michele's eloquent blog - if for no other reason than to rebut some of Michele's side comments (e.g. that Michael's arrival offered the opportunity for her to rest and for you to have someone new to boss around.) Surely that merits a response??" Wayne: Just call me Captain Bligh! 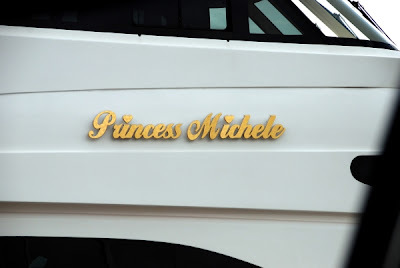 I know Michele's comments are mostly tongue in cheek, but since it is just the two of us, we must work together for many things that require (or at least are a lot easier with) two people, such as docking. When Michael was here, Michele could relax more or sleep in while Michael helped, or we could divide the duties among the three of us. Michele: Besides, I didn't want to deprive Michael of all the fun! He's like his dad and loves to sail. Michael and I have both learned that Wayne is not really "bossing us around." It's just that he's in charge, knows what needs to be done, and has to communicate that to us so we can help. I must say, though, that I am learning the ropes (sorry!) on this trip. He doesn't need to “boss me around” nearly as much as he did at the beginning. Q: "I think we need to hear from Wayne as to the relational qualities this brings out in one's life - mainly dealing with only his wife and the boat for so long. How does this help or hinder one's Christian values - like being servants to one another as Christ served back in His day?" Wayne: In many ways, we have learned to work better together in handling the boat and necessary chores. We also take turns on watch, so we both get free time to read, nap, work on the blog, email, plan our route, study the next locations we are going to visit, etc. Our Christian values certainly help in our relationship. We do respect and appreciate what the other contributes, and often help/serve each other. Michele: We’re a normal couple and have our less than pleasant moments, but they are thankfully few, and usually happen when we’re tired or frustrated. When you know you’re going to be together 24/7 for 3-4 months and are taking the trip of a lifetime, you want it to be an enjoyable experience and have great memories of it when it's over. That does not happen by accident. We have both put a lot of effort into making it a pleasant and enjoyable trip for the other. 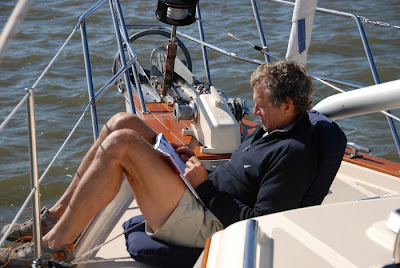 For instance, although I love being a passenger on the boat, Wayne enjoys all the mechanics of sailing more than I do. He is very sensitive to that, which I appreciate, and doesn’t demand a lot of "heavy lifting" from me, although I help out as needed. It's really no different from marriage in general, in that it requires give and take on both sides to make it work. 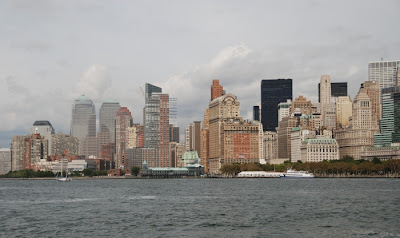 Oct. 2 - Watching the New York skyline gradually emerge from the horizon as we traveled down the East River yesterday was a surreal experience. 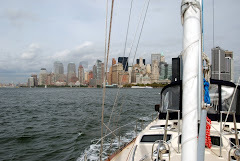 What a vantage point we had, cruising along the east side of Manhattan, under the Brooklyn and other bridges, and past the Statue of Liberty! It definitely qualified as a trip highlight. We welcomed the change of scenery, as lovely as it's been, for the variety it provided. We decided against a stopover there because we have both been to NYC, and one or two nights would only be a tease. You will no doubt be relieved to know that Homeland Security is alive and well, protecting you from the likes of us. 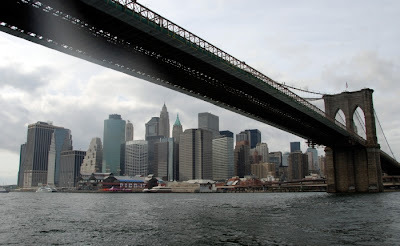 The Coast Guard escorted us in a low-key manner (no one manning the machine gun this time) along portions of the East River, especially near the major bridges. Tonight should be interesting as well: Atlantic City. 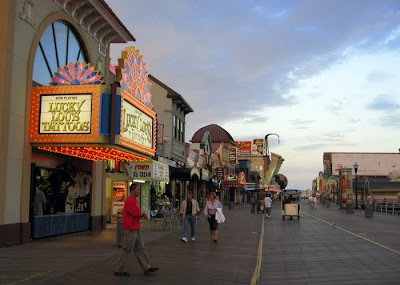 We weren’t planning to stop there, but apparently there are only a couple of places to stop along the Jersey coast, and Atlantic City works out best for us tonight. Rachael called this morning to let us know they finally arrived back in the U.S. last night, having crossed all the way from Lockeport, Nova Scotia to Marblehead, Massachusetts. They had great conditions and made the crossing in good time - what, 38 hours? 30-some hours, anyway. It is becoming less likely that we will meet up with them again on this trip, since we have a deadline and they do not. But that's just this trip - we’ll probably see them in the Bahamas or somewhere in the Caribbean. On a disturbing note, yesterday we received news of a senseless tragedy - a friend of Wayne's and brother in Christ, Chris Effrem, was robbed and beaten and died at the hospital. We don't know the details. Wayne feels terrible that he can’t be there, but our heartfelt sympathy and prayers go out to his family and friends. We also pray that justice will be served. Back in August, Greg and Darlene scheduled a trip to New York, planning to meet up with us and visit friends in Rochester and some of Darlene's friends and relatives on Long Island (where she grew up). Unfortunately, we missed them because they left here two weeks ago when we were still in Nova Scotia. Wayne called his brother Greg yesterday afternoon and told him we were finally in Long Island and where we planned to put up for the night. Greg told him that Darlene's friend, Laura, runs Brewer Marina in Glen Cove, ten miles past our planned destination, and that she would be able to put us up there for the night. Cool! A little while later Wayne got a phone call from Laura, and we were all set. She even gave us a discount! This was God's grace at work. Mike met us when we docked at Brewer Marina at 6:00, which was closing time. He got us squared away and I put a couple loads of laundry in. I actually meant to do laundry in Mystic, but forgot, and was concerned about how soon we would have another chance. This too was God's grace at work. While I was taking care of the laundry, Wayne chatted with a guy on the dock who shared some local knowledge with him regarding our route - where to go and not go, etc. - God's grace at work. This morning we went up to the office to meet Laura and she offered us the use of her car. We had tried to buy groceries in Mystic, but there was only a small store which didn't have much of what we needed. As with doing laundry, I wasn't sure when we’d have another chance to buy groceries, and once again - God's grace at work. I marvel at how God has blessed us with weather far better than we could have hoped for, and not a day passes that we are not aware of him protecting us. It is quite remarkable how I often feel as if we’re in a protective bubble where nothing can touch us. We know that many of you are praying for us - that God would keep us safe and give us favorable weather - and that means the world to us. YOU are God's grace in action, another undeserved blessing for which we praise him and give him (and you!) thanks. Wayne and I have experienced God in many ways over the course of our lives, and now as our Cruise Director. Thank you God, for your grace - on this trip and always.